Please find below the timetabled offer of afterschool revision sessions for year10 and 11. All departments in the school offer sessions, which run either between 3pm and 4pm or 4pm and 5pm (subject to offer). 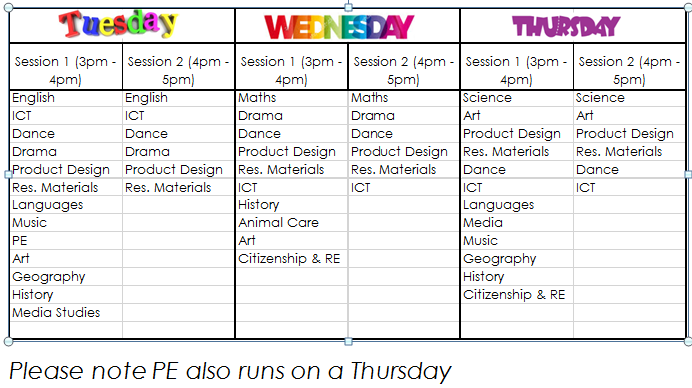 I have included a copy of this timetable for your perusal and would like to encourage your child to make use of these sessions. The sessions are incredibly useful and operate on a small group or even one to one basis. This allows for much more personalised sessions. We would encourage your child to attend as many of these sessions as possible to get the most out of them. However we would advise that they should commit to at least one night a week and make it a regular thing. Attendance can be flexible and if one subject is not available for any reason, your child could drop in to an alternate one. We would also encourage your child to attend a wide variety of subjects – not just their favourites and in the run in to the exam seasons would even recommend splitting their time between two sessions i.e. 3pm till 4pm and 4pm till 5pm. Attendance is of highly recommended but optional and no appointment is necessary. These sessions simply work on a drop in basis. So it is imperative that if your child attends they make you aware and arrange any necessary travel arrangements in advance.